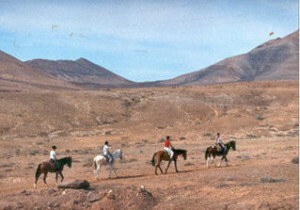 Enjoy pure nature excursions on our well organized rides. 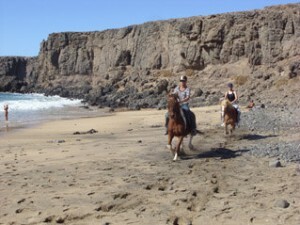 Beaches and the coast of El Cotillo. Balanced and friendly horses are waiting for you at the Granja Tara. 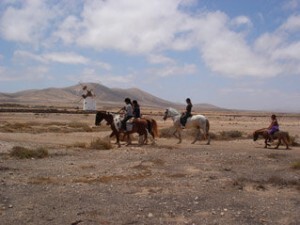 The riding stable Granja Tara is located about 500 meters away from El Cotillo. 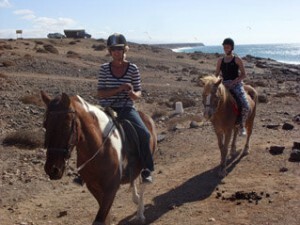 We will pick you up at the hotel, you will enjoy a beautiful trip on a horseback from 1.5 hours along the coast. 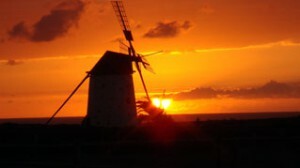 Back at the stable, you can enjoy spanish tapas and the incredible colors of the sunset. Then we will bring you back "home". Sea breeze and waves crashing! We will pick you up at the Hotel. The coast ride will take 1.5 or 2 hours (depending on your choice). Back at the stables, we invite you for a beer or a soft drink and then we will bring you back to your Hotel. Loneliness and a fantastic view over the sea and the west coast. We will pick you up at the Hotel. The mountain ride will take 1.5 or 2 hours (depending on your choice). Back at the stables, we invite you for a beer or a soft drink and then we will bring you back to your Hotel. 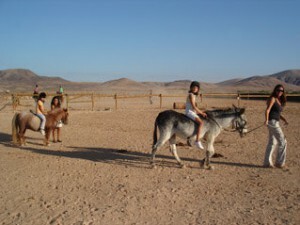 At the weekend, big and small have lots of fun with our ponies and the two donkeys.n.